Going from Wallpaper to Paint | 41 Lumber - Serving Iron Mountain and the U.P. When renovating a room in their home, many people make the choice to go from paint to wallpaper. Generally, the only preparation needed is to fill holes or damage to the wall and then simply hang the wallpaper. There is however, a little more involved when the choice is to go from a wallpapered wall back to a painted wall. The difficulty in doing so can vary due to many factors, such as the age, number of layers, and types of wallpaper. The condition of the walls themselves, or the quality of the wallpaper installation, play a big part as well. If the walls were properly prepared before the existing wallpaper was hung, then removal should not be too much of a problem. 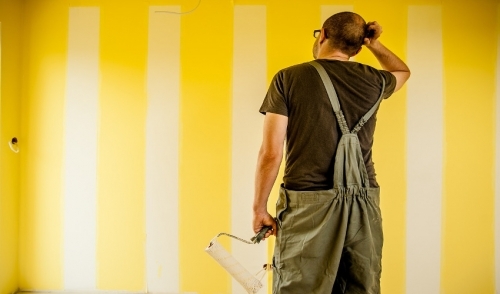 Though it is feasible to paint over wallpaper, this can be complicated by such issues as textured wallpaper, obvious seams, and the risk of loose or bubbled wallpaper once contact has been made with wet paint. To ensure the best results, it is recommended to remove the wallpaper altogether. Once accomplished, the walls must be free of any remaining wallpaper remnants. These could be bits of leftover paper, globs of old adhesive, and other impurities that will get sealed under your fresh coat of paint. These could stand out as blemishes on an otherwise smooth, clean surface. To remove wallpaper, use a sponge to moisten the surface with hot water. Softening the paper will make removal easier. Using a broad putty knife, scrape the paper off, while trying to remove as much residue as possible. If the paper is not coming off easily, then consider purchasing liquid wallpaper stripper. This contains chemicals designed to break down the adhesive in the wallpaper, thus making removal easier. Wallpaper steamers are also available for purchase or rent, to make the job go quicker. Once the wallpaper is removed, you must ensure that the wall is completely clean. A good way to make sure that you have gotten all of the adhesive material off is to dilute 4 or 5 ounces of wallpaper stripper and a gallon of water. Using a pump sprayer, moisten the walls with the mixture. Then, using a wider putty knife, remove all wallpaper scraps and remnants from the wall. Repeat the process, this time using clean water in the sprayer to rinse off any remaining chemicals. Allow the wall to dry for a couple days and sand the surface using 120-grit sandpaper. Inspect the wall surface for any gouges, holes, or cracks. Fill any imperfections with joint compound and allow to it dry. Sand the joint compound until smooth, and dust the entire wall surface in preparation for a coat of primer. Once the primer coat has been applied, your wall should have a smooth, even surface and will provide good adhesion for your paint. Prior applying your coat of paint, inspect the wall for any missed imperfections, since the primer coat may have helped to reveal them. If there are any, lightly sand away any “crumbs” that were sealed in, or use joint compound to fill any indentations that had remained. After a final light sanding and dusting, finish the job with a fresh coat of paint. For all wallpaper removal supplies, primer, paint, and painting supplies, we’ve got what you’ll need. If you have any questions, our staff is ready to answer them, and equip you to get the job done right.